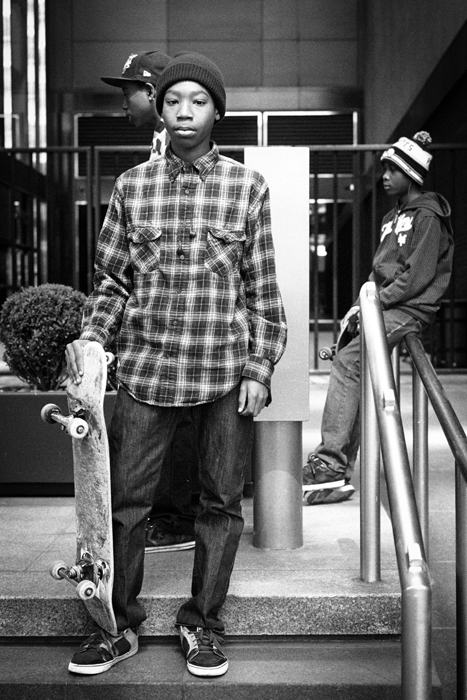 Categories: Men | Tags: manhattan, new york city, photography, portrait, skateboard | Permalink. the style of your photographs, b/w, the contrasts, especially the way the light falls on the persons or you lighten them – all of this gives me the impression as if you’re are taking yourself back as the photographer, deleting, extinguishing yourself: just letting the persons you take pictures from be the whole content of the photograph. although it is a staged theme and some of your models seem to react on you or the camera, it’s as if there is no photographer or camera. thus the picture gains something of a coincidental thing: it’s there, no one wanted it, no one made it. it’s just someone who poses, and I, the viewer, just accidently came in to see that pose. – it’s kind of paradaox, maybe… but this effect stuns me. addition: the difference to a plainly accidental photograph anyone could make, is, that it is, for me, an artistic, deliberately effect. so it’s not just a picture taken, but a photograph. 🙂 and btw: it is, for me, completely different to the pictures on your other pages, which I really like too. J.A., Thanks for your comment. I think you’re absolutely right. When I take someone’s portrait, I don’t give them very much direction at all — only to the extent necessary to take advantage of natural light, i.e., which direction to face. For me, the way that a subject interacts with the camera says something about them. And I don’t want to interfere. For this project, my role is deciding who to photograph, everything else is up to the subject. He seems very deep in thought, great shot.